Schmidt Ocean Institute was created by Eric and Wendy Schmidt to enable research that expands understanding of the world’s ocean using advanced technology, intelligent observation, and the open sharing of information. In pursuit of those goals, we invite select scientific teams from around the world to conduct research aboard our research vessel, Falkor. This has included collaborative science efforts and exploration throughout the Atlantic, the Gulf of Mexico, the Caribbean and the Pacific Northwest, with new research projects beginning shortly in the Central and South Pacific. Falkor, a former German fishing vessel, is now a state of the art, globally capable 272-foot research vessel thanks to a USD 60 million refit completed by SOI in 2012. She has a 13,000 nautical mile range and a maximum speed of 20 knots. One of the ship’s key assets is a specialised gondola beneath the hull that isolates an array of sonar senders and receivers from the interference of bubbles washing down the main hull. This allows survey work at 12 knots—the normal cruising speed. 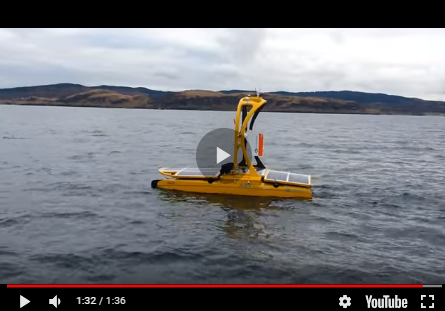 Falkor is equipped with sonar systems for shallow and deep seafloor mapping, sub-bottom and current profiling, and fisheries studies like the Kongsberg EM302 multibeam echo sounder for deepwater and the Kongsberg EM 710 for shallow water. Kongsberg also supplied the single beam echo sounder (EA600). Other devices are the Knudsen CHIPP 3260 sub-bottom profiler and two ADCPs: the 75kHz Teledyne Ocean Surveyor and the 300kHz Teledyne Workhorse Mariner. Much of the research supported on Falkor has involved remotely operated vehicles, which can be piloted from the ship’s comfortable, advanced control room. To date three separate ROV systems have been integrated onto Falkor for different projects — Deep Sea Systems International’s Global Explorer, Woods Hole Oceanographic’s Nereus, and the Canadian Scientific Submersible Facility’s ROPOS. After Falkor’s 2012 re-launch, the institute invited a number of research groups aboard during shakedown cruises that, while intended as tests of the ship’s systems, also offered opportunities for a variety of studies. These included the first ever exploration of drowned reefs along the Southwest Texas Banks that are critical fish habitat, and studies of deep coral areas damaged by the Deepwater Horizon spill. An initial test of Falkor’s sonar mapping system, which is one of the most advanced in the world available for ocean research, discovered the remains of the wreck of the S.S. Terra Nova, a historic polar exploration ship that sunk off Greenland in 1943. In 2013, SOI began full operations. Work with a wide range of collaborating scientists and institutions has included mapping the area hit by a massive asteroid or comet that scientists believe may have caused the dinosaurs’ extinction 65 million years ago, and a study of the geology, chemistry and biology of hydrothermal vents near the Cayman Islands. After a side trip to produce the first detailed maps ever of deep reefs near the island of Roatan, Falkor came through the Panama Canal in June of 2013—the vessel’s first entry to the Pacific. Since that time projects have included work with Canadian scientists to track the inshore spread of potentially harmful, oxygen-depleted waters originating in deep waters off British Columbia’s Vancouver Island, and a study of microbial and viral life within an undersea mountain called the Axial Seamount, about 300 miles southwest of Seattle. Falkor is currently in Hawaii with plans for multiple expeditions operating out of Honolulu through the fall of 2014. Collaborative projects for 2014 will include mapping the deeper reaches of the new Papahnaumokukea Marine National Monument in the Northwest Hawaiian Islands, and exploration of the Marianas Trench off Guam, including the deepest spot on the planet. Marine research groups that would like to work aboard Falkor submit proposals that go through a rigorous peer review by scientists from relevant fields. From proposals that receive high ranks for scientific value, the institute chooses those projects that best align with its mission and that require work in geographical areas Falkor can reach in a given year. SOI’s sister organisation, the Marine Science and Technology Foundation, also supports the development of promising oceanographic technologies that might one day be used aboard Falkor or elsewhere.